Throughout it all -- and as you might imagine there have been schedule changes a-go-go -- Leo has been a good sport, cheerful and adaptable. 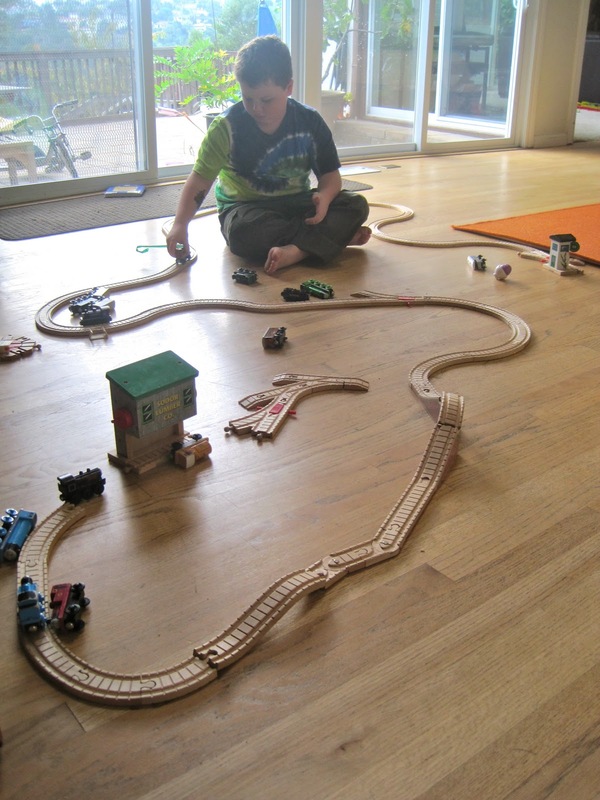 He's been using great language, been intensely social, has demonstrated unprecedented awareness regarding self-care, and just yesterday upended everything I've been saying during my last few weeks' worth of iPad talks and workshops about him rarely doing non-iPad independent play by doing some fairly awesome non-iPad related independent play: He set up this entire train track by himself, using every last piece of track we own. Pretty damn cool, eh? He even let his godmother TLF play with him. Lovely. Love that boy. That is so awesome :) I love it when my girls step away from the electronics to engage in regular play. Very cool. 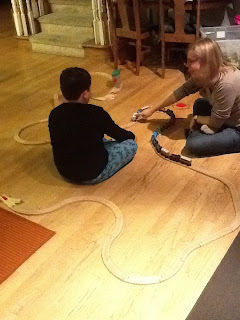 It's always been one of my frustrations that I never quite managed (yes, as a 30+ year old) to set up my kids trains so that I used every piece. My son is 13 and I still catch him playing with his little brother's train set. Great set up, BTW. Yay for great weeks! Hugs! I actually got a little bit tired just reading about all of it. Glad I wasn't LIVING it. That really is true... No matter what, there's always trains.